Welcome to Bonus Sunday! 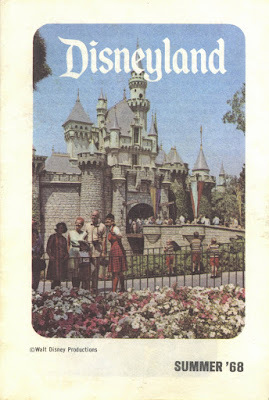 From Tuesday’s NRC Nite post (link)., here is the entire Summer 1968 Disneyland Guide. Naturally this is one of my favorite pages! Your Summer 1968 entertainment line-up, ah the gold old days! 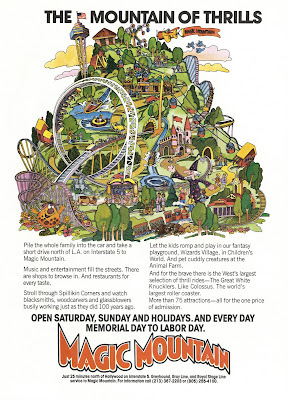 Late but not forgotten, this Vacationland Summer 1978 issue was shown on a post a couple weeks ago (link) but got missed last Sunday. There must be at least one ad for every Southern California Tourist destination in this magazine. When did Scooby and the gang invade Marineland? Two daily parades this summer! 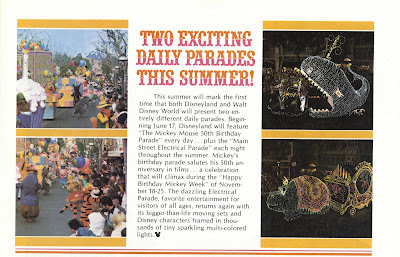 Sound like a great idea for 2010, do some silly 55th parade during the day then at night run the Main Street Electrical Parade on Main Street! A Chilly Challenge; to find a way out…. Does anyone else remember these candies during the 1970’s? 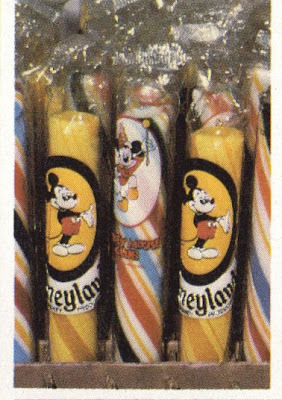 I seem to recall these candies had a resurgence in the late ‘70’s, I remember buying $5 worth at Disneyland and eating them eating them all day long, at some point they become lethal and started to slice up your mouth pretty bad! 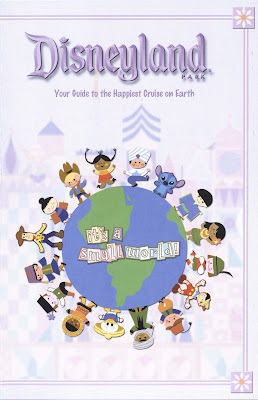 Now that the controversy over the new additions to It’s a Small World have calmed down, lets take an “official” look at the changes. I guess they gave these out the first few days it opened? Funny, I was there a week after it opened and got nothing but a long line! The “additions” look more dramatic on this map than they really are. Oh they are there and a couple of them do stick out a little (Woody & Jessie! ), but when weighed against the amazing upgrade to the lighting and audio systems, plus the overall grand refurbishment, it's a win for Disneyland fans. 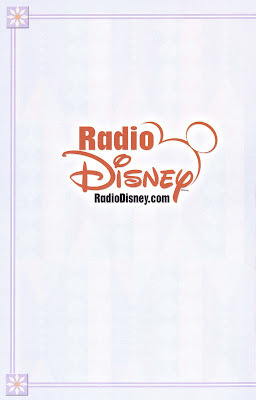 The back has this Radio Disney ad. I guess Small World has no sponsor, so why not self promote? 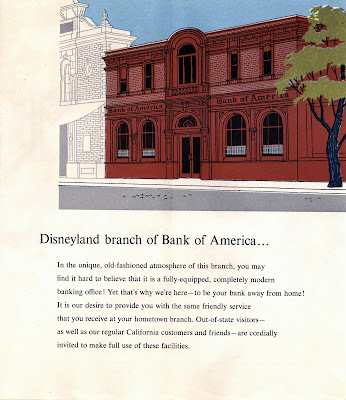 As the “Bank on Main Street” at Disneyland gets ready to close, and following up on Davelands super Vault Door post yesterday (link) let’s take a look back near the beginning of the banks history. 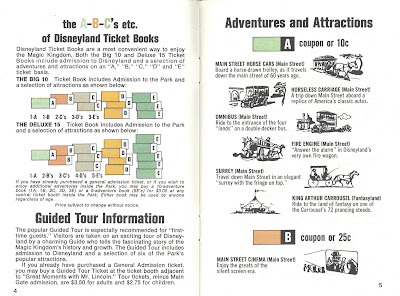 This “Your Guide to Disneyland” is compliments of Bank of America. 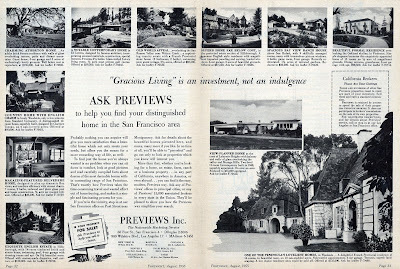 This brochure is almost identical to the first version produced by Bank of America in 1955 (link to prior post), even the front panel is dated 1955. 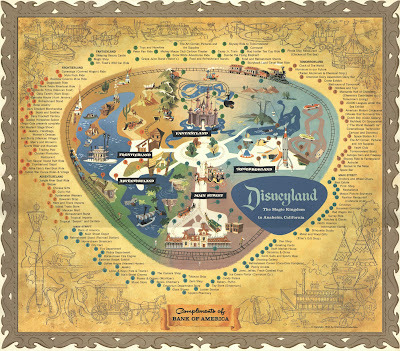 However, as the inside map will reveal, this version is from 1956. Nice rendering of the bank, even if there are a couple of windows missing (link). You can check the prior post (link) to see the $1 version that was sold on EBay, I can’t recall how much it sold for, but it was in the hundreds. 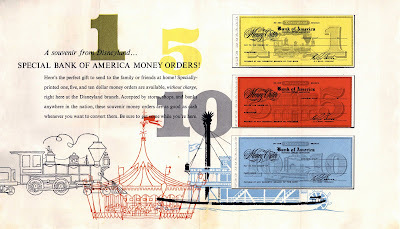 Notice the $10 money order has an incorrect “side wheeler” as the river boat at Disneyland. This map is very different from the 1955 version (link). 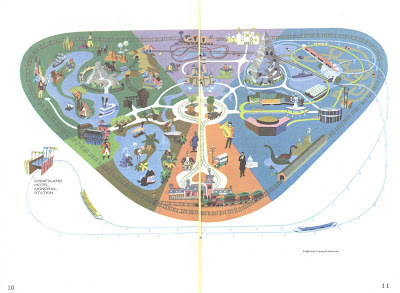 While the 1955 version has drawings that attempt to represent the actual structures, this 1956 version is very whimsical and cartoonish. I like them both, but the 1955 one is still my favorite, probably because its the first edition. The back panel does have a slight change, or revision from the original (link). The red ink show an update to 600 branches and B of A is a member of the FDIC. “Two wonderful ways to enjoy Disneyland”. I’m really digging the cool blue ink of this parking lot flyer from May 27 & 28, 1972. You better read what’s inside, it’s IMPORTANT! 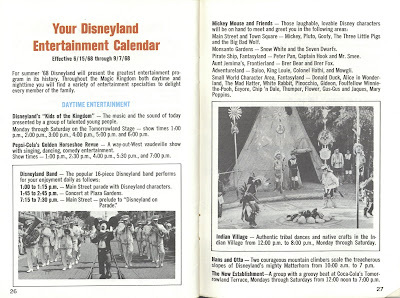 “Another Disneyland Entertainment Special at Regular Prices!” I bet that weekend was indeed “two fun-filled nights of entertainment”. Then a Memorial Day Parade on Monday and the new Bear Country! Here’s your two wonderful ways to chose from. 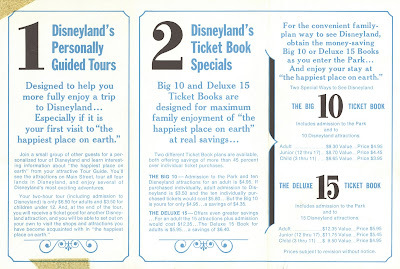 Come on, go for the Deluxe 15 Ticket Book, its Disneyland! For goodness sakes “don’t misplace your car”! Oh and Pluto says I have permission to kick your rear-end if you leave your pets in the car. How about some vintage color? This snap shot is naturally undated. I could try and pass it off as 1972, but I think the Upjohn Pharmacy left Main Street around 1970, so let's call it 1968. Welcome to NRC Nite at Disneyland, May 25, 1968. I wonder what NRC this was for; Nuclear Regulatory Commission, National Research Council, National Response Center, Natural Resources Conservation and the list goes on. Oh well, whoever they are, they got a private party at Disneyland! You’ll need a guide book to find your way around the park. I like the stylized map, it just invokes fun doesn’t it? 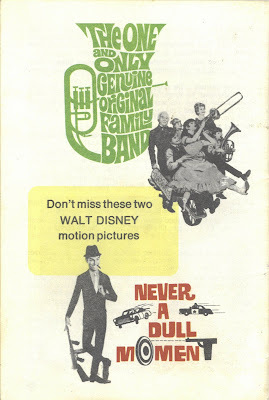 “Don’t miss these two Walt Disney Motion Pictures”… I’ve never heard of either one so I guess I missed them both! 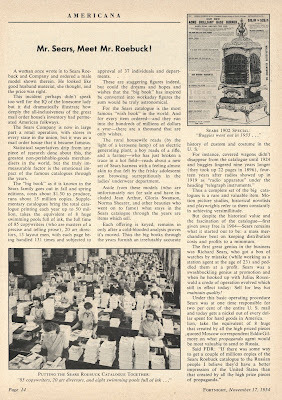 Come back on Bonus Sunday for the entire guide and last weeks Summer 1978 Vacationland (link) that got missed on last Sunday. Welcome to Magazine Monday. Today’s post of two Fortnight magazines is a kind of a repeat. These haven’t officially been part of Magazine Monday since they it appeared in a couple of separate posts last year. In case you missed them (of forgot you saw them) I’ve repackaged both issues into one post and added more vintage advertisements & articles. First up, "Fortnight" Magazine, from November 17, 1954. 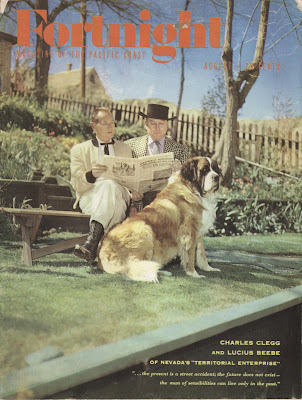 "California's Own Magazine". Each realm is a “Land” of its own; Adventure Land, Tomorrow Land, etc. “Pirates” in Frontier Land, it will never happen. “A Paddle Wheel river boat (capacity of 300)” I always heard they didn’t figure out the “capacity” until after the park opened and the Mark Twain almost capsized? “Passengers can identify the places they are passing; Mt. Vernon, New Orleans, Mobile.”? “Drink root beer at Paul Bunyan’s Bar”. Looks like there were some changes to the plan after this was written. And now a couple articles. 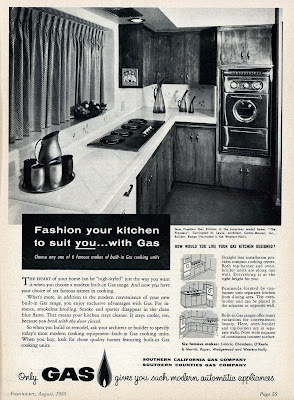 Back when Sears was king of retail. 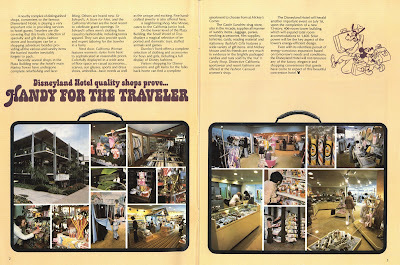 If you’re into vintage stores, check out Pleasant Family Shopping blog (link), I visit there daily. 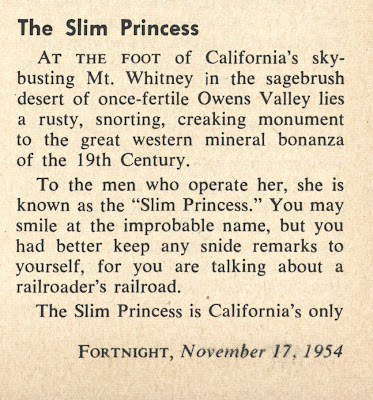 Trains buffs take note of this article; The Slim Princess, soon to end, “California’s only remaining narrow gauge line”. Couldn't you just image that engine at Disneyland? For some color, here’s a great ad for Old Sunny Brook Brand whisky. That looks just like me and my friends when we go camping: coffee, whiskey, a large ax and fishing poles, ah the good life. Park Lane, seems a little pricey to me. Well, its does have touch plate wiring and a radio controlled garage door, I’m sold. If you live in a hot climate, I believe there is still some truth to this. 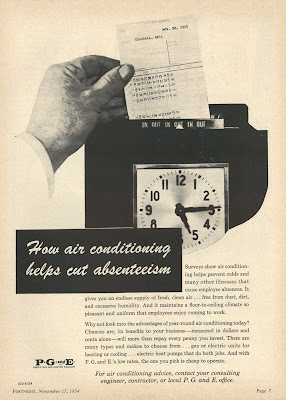 Nothing beats commercial air conditioning when its 114 outside. From August 1955 it’s Fortnight. 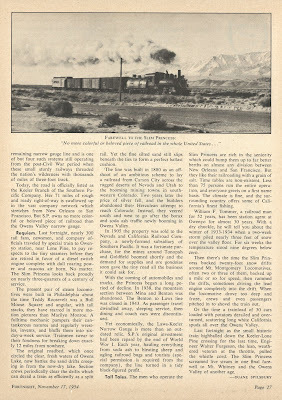 Now a "Magazine of the Pacific Coast”. 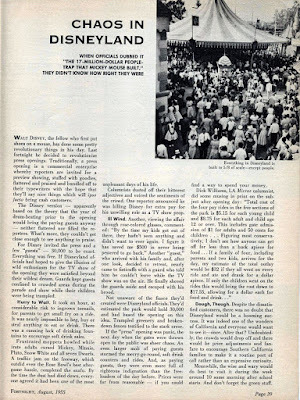 Three whole pages of luscious black and white were used to “review” that new "Disneyland" place, and well, they really aren’t so nice. Read it for yourself and see if you hear a certain “tone” “undoubtedly the crowds would drop off and there would be price adjustments” they were half right! 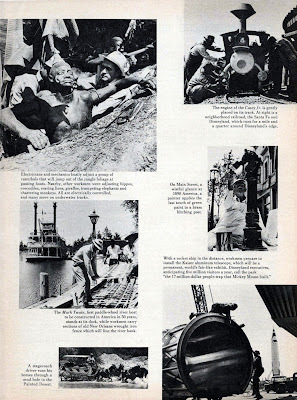 All of these photos on the following two pages are new to me, having only seen them here. I wish they were in color and better quality, but still fun to look at. That stagecoach running thru the “mud hole” looks completely unfamiliar to me, anyone else? No American car ads in this magazine, I guess those cars weren’t for people of the “Pacific Coast”? 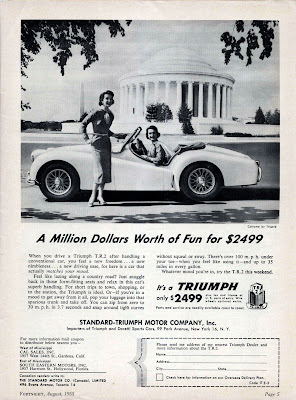 Fun little Triumph TR2, over 100mph and 35 mpg! Hey, it's not parked on the Pacific Coast!!! This kitchen looks very familiar. My “Cinderella” model 1958 track house has pretty much the same kitchen. Non-stop coast to coast in style! A DC-7 cruises at 355mph, that’s about 8 hours, a huge improvement of the old way! Check out the prices of the “Gracious Living” homes! 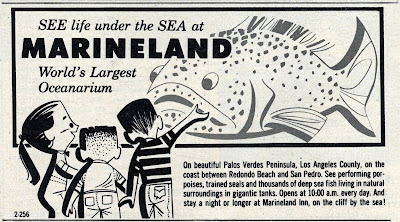 Vintage Marineland ad, it opened in 1954. 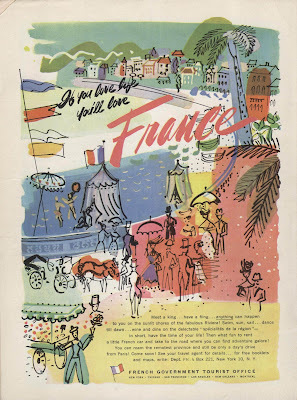 The back cover with some great 50’s artwork demonstrating how wonderful France was to visit, “Meet a King”. Time for a look at some food exchange tickets from Disneyland. I’m not sure how you got these, but I think they came with certain special event tickets. First up, from 1984, this card was good for one A La Carte meal at any of the four listed restaurants. $10.75 must have been for the highest priced item at the time? The Tacos Monterey today is about $10, I wonder what Casa Mexicana had that was near that price in 1984? 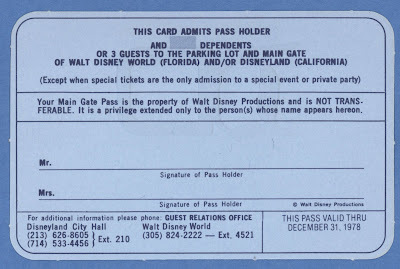 From 1989, this little card could be exchanged for a yummy Citrus Freeze Swirl or Jungle Freeze. I didn’t realize both Sunkist locations were still at the park in 1989, when did they leave? And why? 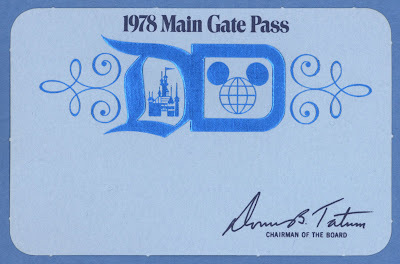 This Main Gate Pass from 1978 was unfortunately never used, all those smiles that never happened. Good for parking and Main Gate access at both Disney parks for an entire year, for you and up to _____ dependants or 3 guests. If I’m letting one of my “guests” get into Disneyland for free, they are now officially my dependant. How about some color? 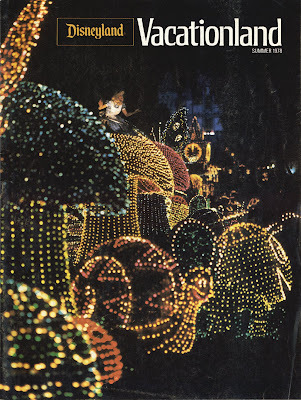 Here’s the summer of 1978 Vacationland with the Main Street Electrical Parade on the cover. I hear the MSEP is getting thousands of LED’s all tied into the new Tinkerbell float at the front. 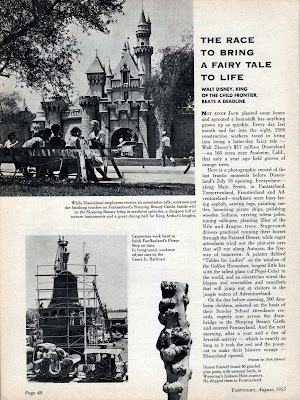 They really need to bring it back to Disneyland, maybe for the 55th??? Is any of this still on the Hotel property? I’m thinking it’s all gone, but I’m really not to familiar with the Hotel, does anyone know for certain? Speaking of Vacationland magazines, I heard that the D23 website was showing some of the Vacationlands online. How cool is that! 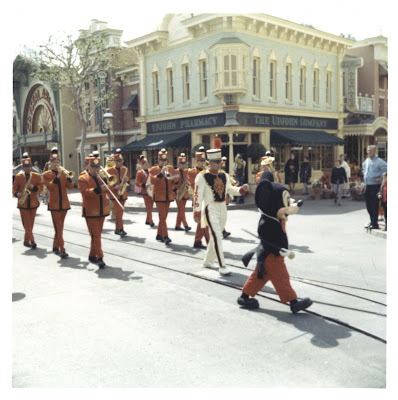 In the archives sections (link) they have a “What old is News” section with great posts that use a page or two from a vintage Vacationland or Disney News (link). I wonder if “members” (I’m not one) can get more than a page or two? The archive’s have Binders with the contents of every issue in mint condition, I’ve seen them in person and almost fainted. Busch Gardens - Van Nuys, California.